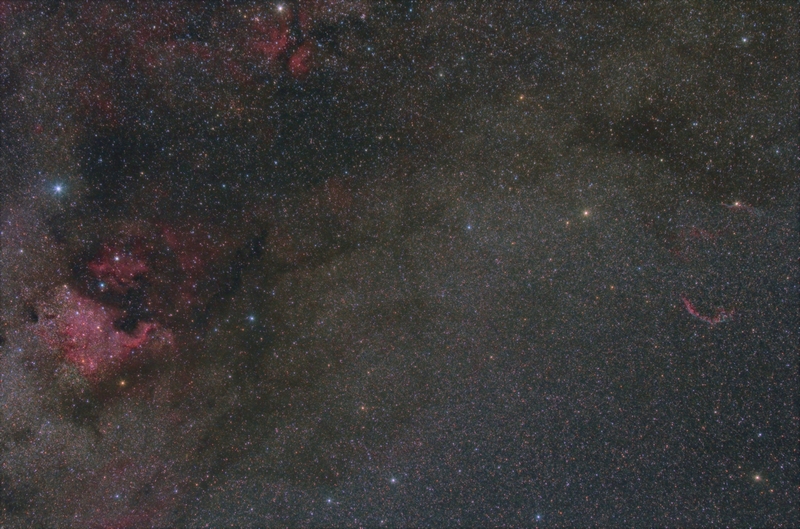 Here is a recent wide field image of the north west quadrant of Cygnus, one of my favorite parts of the sky. Emission and dark nebula abound in this patch of the Milky Way from NGC7000 to the Veil Nebula. Processing This image was processed entirely in Images Plus. No calibration frames were used as the lens is reasonably flat and did not require flat frames, in camera dark suppression removes the requirement for darks and bias frames. An arcsinH stretch was applied to the original image and then the nebula and star images were split using the feature mask tool. The red was enhanced using an additive colour balance with a mask made from the red channel. The nebula image was sharpened using multi-scale decomposition, applied with a mask, and then recombined with the star image. Image binned 2 by 2. Slight star reduction applied.